My Wife is Hot. The Room Is Cold: Whose Perception is Reality? Men are from Mars. Woman are from Venus. 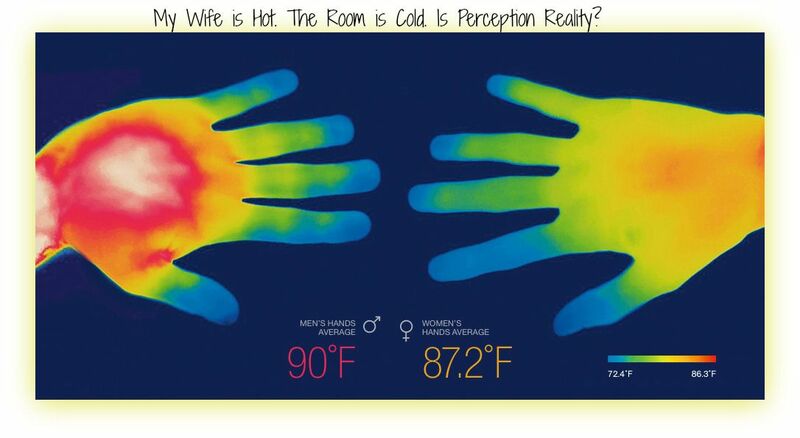 When it comes to body temperature, perception is actually reality. There are generally three factors that affect your perception. The first is your tolerance. Moving to Florida affects your ability to handle the cold while moving to Alaska will affect your ability to handle heat. The second is body fat which provides insulation. The more body fat, the greater your insulation. Brown Fat is also responsible for regulating your body temperature. Your body burns brown fat to make heat. This is why there is a theory that if you expose yourself to cold temperatures, you will increase your weight loss. The third is your body’s ability to conserve and regulate core temperature. The hypothalamus in your brain helps regulate your body temperature by triggering changes to the sweat glands and muscles. The body can then increase or decrease the amount of heat lost. Body temperature is also regulated by our arterial and vascular systems by causing vasoconstriction or vasodilatation. Vasoconstriction is the narrowing of the blood vessels resulting from contraction of the muscular wall of the vessels, in particular the large arteries and small arterioles. When you dilate your vessels, you allow more blood to go to your arms and legs, which will cool you down. When you vasoconstrict, you maintain the core temperature because you have less blood exposed to the external environment. Sweat also helps cool you down and radiate heat. Your innate ability to control your vascular ability and your sweating will control your ability to cool down or stay warm. Those factors coupled with hormones and metabolism will give everyone their individual experience. Excessive thyroid hormones, testosterone, epinephrine, norepinephrine and dopamine will raise your body temperature. Lack of estrogen will also make you feel hotter. 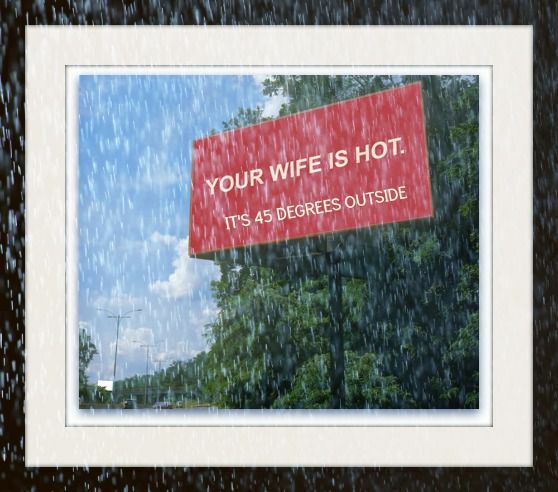 Which is why your wife is hot. Researchers have also found that women may have up to 9x more complaints of cold hands and feet. But that is probably due to hormonal imbalance, metabolism and body fat. That expalins why your wife is cold. • Make sure to stay hydrated since hydration plays a role in heat maintenance. If you are better hydrated you can better control your body temperature. • Have your hormones, Iron and Vitamin B12 levels checked by your cardiologist. Deficiencies in Iron and B12 will make you feel cold. • Dress according to your body temperature. If you tend to be cold, layer up. If you tend to be hot, wear breathable fabrics. When all else fails, turn down the air and pile on the blankets. It’s a small price to pay for aligning the planets.